Welcome to Siloam Springs Bible Church! Thank you for visiting the website of Siloam Springs Bible Church. We exist to glorify God by loving Him and making disciples. Our vision is to build caring relationships to connect our homes, our community, and the world to Jesus. 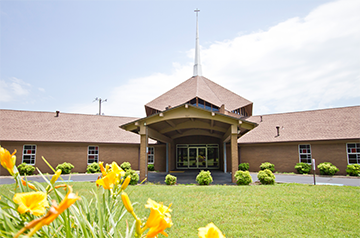 We invite you to explore the website and learn more about the ministries at SSBC. If you live in Northwest Arkansas, you are welcome to come worship the Lord on Sunday morning. Below you will find some basic information about our church and what to expect as a visitor. Please contact us if you have any questions. We look forward to meeting you! Siloam Springs Bible Church is part of the Evangelical Free Churches of America. Click here to read our statement of faith and here to read our core values. Click here for directions. If you visit our church, we invite you to dress comfortably. Some people wear jeans, while others wear collared shirts and dresses. Each week, we study the Word of God for a portion of our service. We are usually going through a book of the Bible or longer passage of Scripture from week to week. Click here to listen to our most recent sermons. Pastor Bruce preaches most weeks, but we have a variety of other gifted men who preach from time to time. He generally preaches out of the New International Version Bible. We usually have a slide show to go with our sermons. The preaching time is about 30 to 40 minutes long on average. Music is another major way that we worship the Lord in our services. Our musical style is a blend of traditional and contemporary music. We sing the old hymns of the faith as well as modern praise choruses. We have a music team that leads us in this area each week. If you have any questions about the music ministry, feel free to contact us. We believe that it is important to disciple children and encourage them to love the Lord. Therefore, children sit with their families for the first portion of the service. During the Meet & Greet part of the service, children ages three through second grade are invited to attend children's church. We also provide nursery during each service for children through two years of age. A nursing room is available for mothers with infants. Click here to learn more about our children's ministry. At 9:50am during the fall, winter, and spring, we offer various Sunday School classes for all ages. Adult Sunday School classes are divided into different topics, and children through youth are divided into different age levels. College students are welcome to attend the college class or one of our adult Sunday School classes.